If you're not a fan of fruity Christmas cake, why not serve up this chocolate show stopper instead - chocolate brownie reindeer cake with cranberries & white chocolate chunks. It tastes as good as it looks and the good news is that it's actually really easy to make! Six layers of brownie cake, studded with cranberry & white chocolate chunks, are sandwiched and encased with creamy chocolate ganache. Ganache is also piped on top of the cake to make reindeer 'hair'. The reindeer antlers, eyes & nose come in a reindeer topper set from Etsy. They are made of glitter card and give the chocolate reindeer cake the wow factor with no effort at all. I use a cake smoother (which is just a little plastic spreader) to make my chocolate reindeer cake really smooth. If you don't have a cake smoother, just use a fork in upwards motions for a 'shaggy' chocolate reindeer. You could also skip the piping and just use the same effect on top if you prefer. A good tip is to bake the cakes the day before you are planning to frost and assemble them to give adequate cooling time. Ganache and warm cakes do not mix! The six cakes are baked in pairs, so that's three rounds of baking. It sounds a lot but the cake recipe is easy and bakes in under half an hour, so it's quite quick. 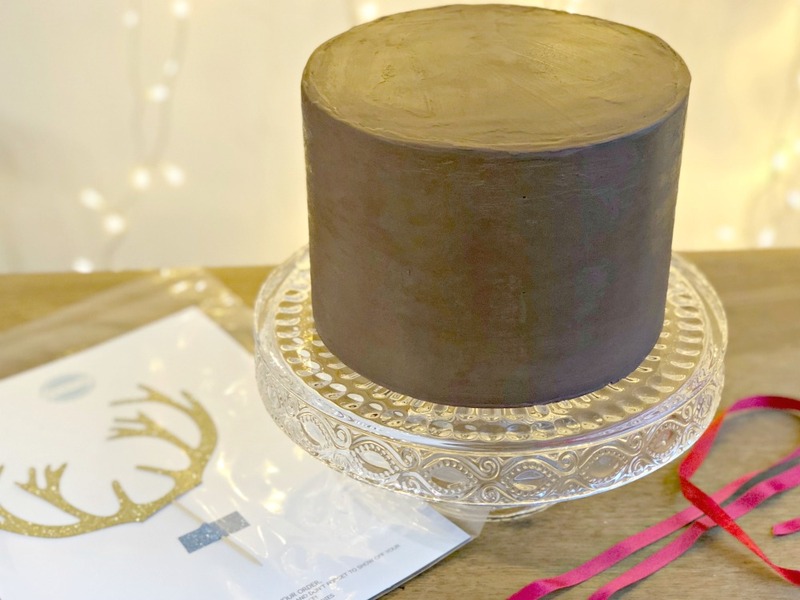 This chocolate reindeer cake is huge - it makes up to 40 large or up to 60 small servings, so ideal for a Christmas party. Leftovers do freeze well if you have any - cut into individual portions and freeze in an airtight container. This cake is very rich, so just serve it with some chilled cream or mascarpone. Enjoy! Line two 18 cm round baking tins with baking paper. Grease each tin well with butter, sprinkle with flour and tip around to coat the inside with a thin film of flour. Place the 175g butter and 175g dark chocolate in a pan and melt over a low heat stirring all the time until smooth and combined. Remove from the hob and leave to cool. In a bowl, whisk together 175g sugar, 3 eggs, 1 tsp vanilla extract and 1 tsp salt. Use a whisk to mix everything together really well. Scrape the cooled chocolate mixture into the eggy mixture and use a whisk to mix everything together until well combined. Sieve the flour onto the mixture and fold it into the rest of the ingredients until just combined. Finally sprinkle over the white chocolate chunks and dried cranberries and fold them carefully into the mixture to distribute evenly. Scrape half the mixture the mixture into one tin and the other half into the other tin. Bake for 20-25 minutes until a skewer comes out clean. Allow cakes to cool in the tin before running a blunt knife around the edge of the tin and tipping them out onto a cooling rack. Wash tins and repeat recipe a further two times so you end up with 6 cakes the same size. Place the cream and dark chocolate in a pan and stir over a medium heat until the chocolate melts and the mixture is smooth. Take the pan off the heat and leave the mixture to cool a little. When it's cool enough to comfortably stir with your finger add the white chocolate to the pan and stir well until the white chocolate has melted completely. Don't be tempted to place the pan back onto the heat at this stage, just keep stirring and it will melt eventually and make a beautiful creamy ganache. Leave the ganache to cool and become slightly stiff before using it. Do not leave it to cool completely or it will become too hard to use. 1. Use a sharp knife or a cake leveller to level off each cake a little so when they stack up they will be level. Tip - use tops of cakes to make chocolate truffles. 2. Place one of the cakes on a cake turntable (or a plate if you don't have one) and spread an even layer of ganache around 3mm thick all over the cake right up to the edges. 3. Place another cake on top of the ganache and repeat until you have one cake left. Place the final cake upside down on top of the ganache. This helps to give the cake a straight edge. 4. Ensure all the cakes are sitting directly on top of each other before inserting three kebab skewers into the cake to keep it secure. Trim each stick to make it the same height of the cake. 5. 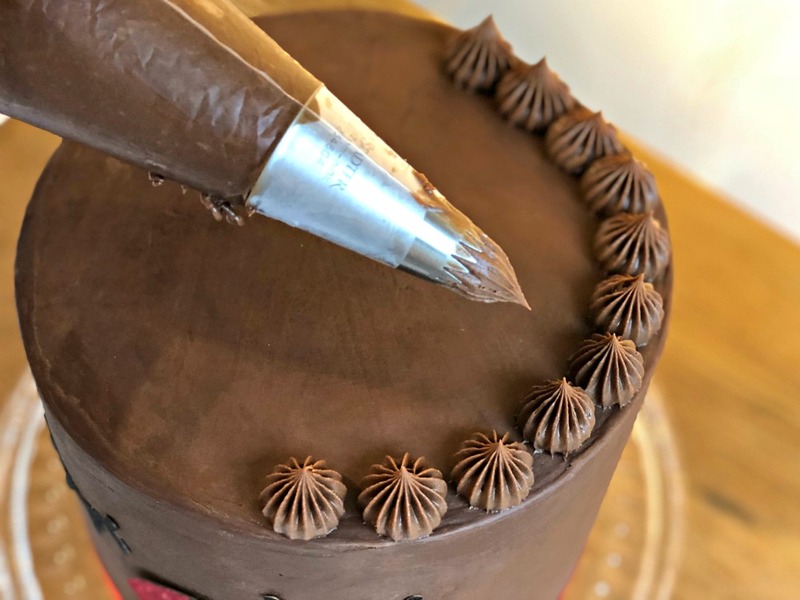 Using a long pallet knife, spread a thickish layer of ganache all over the sides and top of the cake and spread out as evenly as possible with the pallet knife. This is much easier with a cake turn table, but it's possible to do it without one. 6. For a smooth finish, clean up your pallet knife or use a cake smoother to go over the ganache until smooth. Scrape any excess ganache back into your bowl. If you prefer a rough look, go over the ganache with a fork instead. 7. 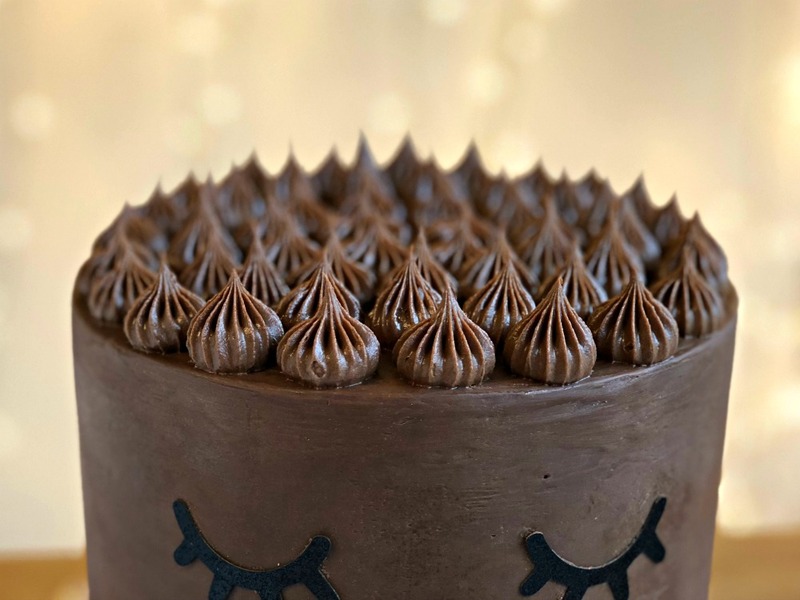 Chill the cake in the fridge for an hour or to allow the ganache to firm up before transferring it to the serving plate or cake stand ready for the finishing touches. 8. Use some leftover ganache to 'glue' on the eyes and nose of your reindeer. It helps to curve them gently before hand so they are a similar shape to the cake. 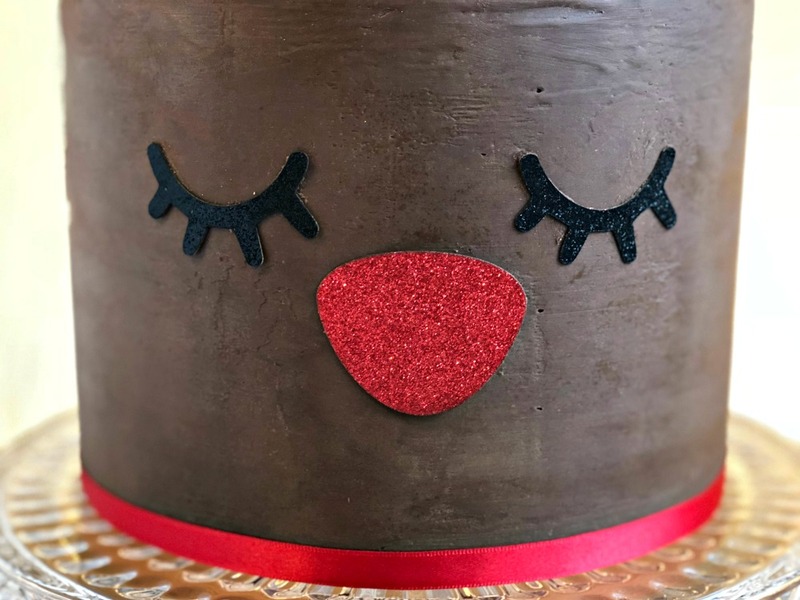 Use a red ribbon around the base of the cake to make a 'collar' for your reindeer. This also helps hide any imperfections! 9. Place the leftover ganache into a piping bag with a star nozzle and make 'hair' on top of the cake with the piping bag. If the ganache has gone a little stiff at this point you can warm it very gently again in the pan to loosen it stirring constantly before filling up the piping bag. 10. Finally, add the antlers to your reindeer and your creation is finished! Serve at room temperature with cream, mascarpone or just by itself. Enjoy!